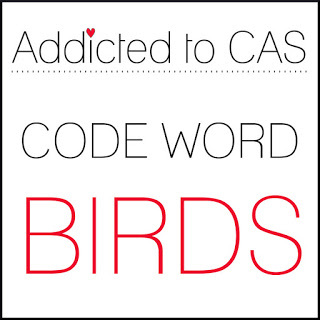 Ellenor is our host at Addicted to CAS and she chose birds as her code word. I love birds and toyed with which one I might put on my card. I hope it's okay to do just one because that's what I did, using my long neglected Crazy Birds from TH. As usual it's the sentiment that proved more difficult but I thought his buggy eyes went perfectly with the sentiment from MFT. He's colored with Zigs and his eyes are cut separately, popped up and covered with Glossy Accents. I know you have at least one bird stamp you can use to make a card for our challenge. The rest of the Design Team and I are waiting to see what you do. Happy Little Stampers is offering a $20 voucher to the store for the winner of this challenge. Just make sure your card is CAS. I can never get enough of these birds. Mine have been neglected too, and you have inspired me to dig them out. The sentiment is perfect to go with the expression on this little character. I just love it. I really love this card, Bobby! Beautiful coloring on one of my favorite 'birds' and your sentiment is perfect! 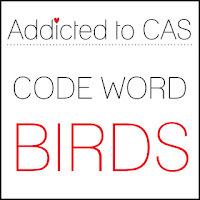 I think your wonky stitching around the border works so well with your CAS design, too ~ Awesome take on the code word! Your bird looks so sorry the birthday flew by! Perfect match for the sentiment! Love the eyes! This guy is so fun...love him! Cute, cute, cute! Love what you did with his eyes! Tee hee! Your bird, sporting his dapper purple feathers and with a bug-eyed look, is perfect for the sentiment! Fabulous!